My 60 days in this 60-day Whole30 program ended early Sunday morning, which means that it’s time for another weigh-in. On day 1, Jan. 15, I weighed in at 315.8 pounds. When I checked the scale for the first time since then on Sunday morning, March 16, exactly 60 days later, I weighed in at 303.8 pounds — a loss of 12 pounds in two months, averaging almost a pound and a half per week. That’s almost the equivalent weight of a gallon and a half of liquid. That’s about twice the rate at which I’d been losing weight during the period from mid-April 2013, when I first started CrossFit while following a half-assed paleo/primal diet, through mid-January 2014 when I first began Whole30’s variety of strict paleo. During those nine months, I dropped from 345 pounds to 315, averaging a little more than three pounds per month or three fourths of a pound per week. This increased rate of weight loss since the program began can’t be attributed to working out more, because my schedule and the weather got the better of me and I definitely worked out less during the program than I had during most of the months beforehand. The two primary competing theories of weight gain and loss would each account for this result in different ways. Either I lost more weight because this ended up being a lower-calorie diet even though I didn’t track those calories, or I just ate far fewer foods that spike the insulin that triggers fat storage. Even though these theories explain the process in different ways, they could also both simultaneously hold true in any particular case study. But weight loss isn’t supposed to be the primary point of all this, no matter how inclined I am to focus on it personally. I generally feel better and more energetic, and lighter on my feet, with a stable appetite and greater ability to forego temporary satisfaction in order to work toward longer-term gains. I deem my program participation a success, and a worthwhile foundation for the future. I want you to write a post that could be shared with someone you care about who doesn’t believe that this may be a worthwhile effort. On the flip side, this program may not have been worth it, and in that case, I’d like the note to explain to them why they should avoid this program. For all the reasons I pointed out above, and in yesterday’s post, I’m happy with the program experience and its results for me. But should you try it too? It can seem awfully limiting and restricting looking at it from outside. But really, 60 days isn’t a long time in the scheme of things to give up a few kinds of food — especially if you focus on the great foods that are left. For instance, just yesterday a Facebook friend commented on one of my program posts, “No fruit would have done me in.” But, really, it wouldn’t do her in, and that may be the program’s primary benefit — the ability to demonstrate to yourself that you can have sustained mastery over what you choose to consume. You can do it. Whoever you are, reading this, you can do it, because if my gargantuan self can turn away from years of gluttonous indulgence there’s no question that you can give up your favorite foods for two months. You think you can’t? You’re wrong. And you deserve to prove that to yourself. 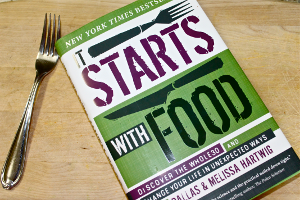 So take a few minutes to read the primers on why it’s a good idea to try going without sugar, grain, dairy, legumes, and alcohol for a few weeks. If those don’t quite push you over the edge, try reading a bit more. Then eliminate them consistently from your diet for a few weeks and test how you feel. After the program ends, try reintroducing some of those food types one by one so you can see in a tactile, practical way whether they make any difference. Maybe you’ll conclude that it’s all fine, and you should just go back to eating whatever you want. But maybe you’ll discover something that’s been holding you back in your life and your health goals, something that you never would have discovered without simply testing its absence from your life for a brief window of time. I woke up at 10:35 a.m. (after heading to bed at 4:05 a.m.). Writing last night’s entry kept me up later than I’d planned, and I woke up earlier than my alarm, which I’d set for 11:25 a.m.
Today is dairy day! Now that 60 days have passed, it’s time to see whether changing this one variable in my diet will have a noticeable effect. 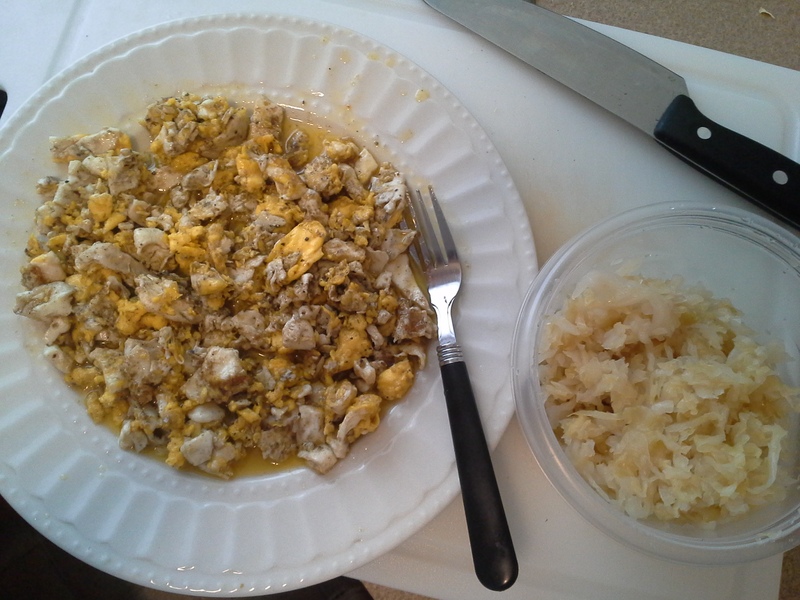 First up, eggs swimming in Kerrygold grass-fed Irish butter for breakfast, then much more dairy later today. 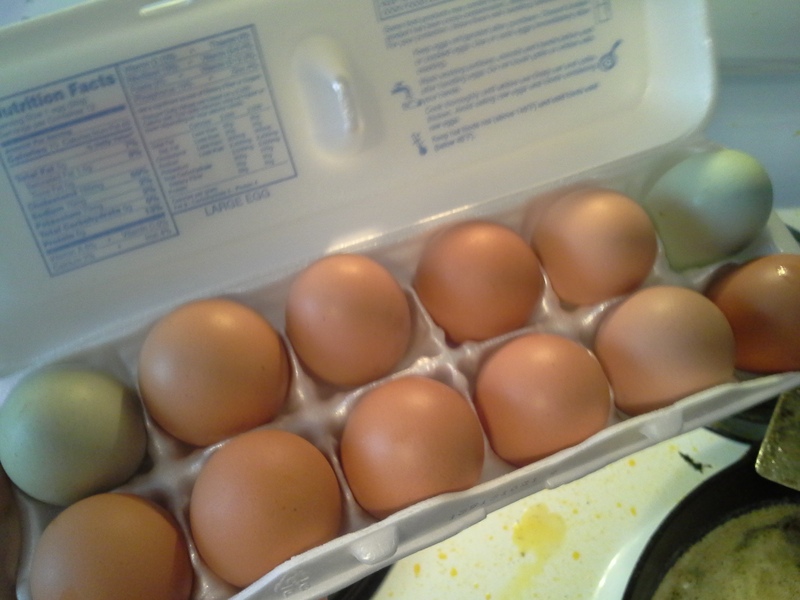 I think this is the first time I’ve ever had (naturally) blue-tinted eggs, incidentally. Not that it makes any difference. 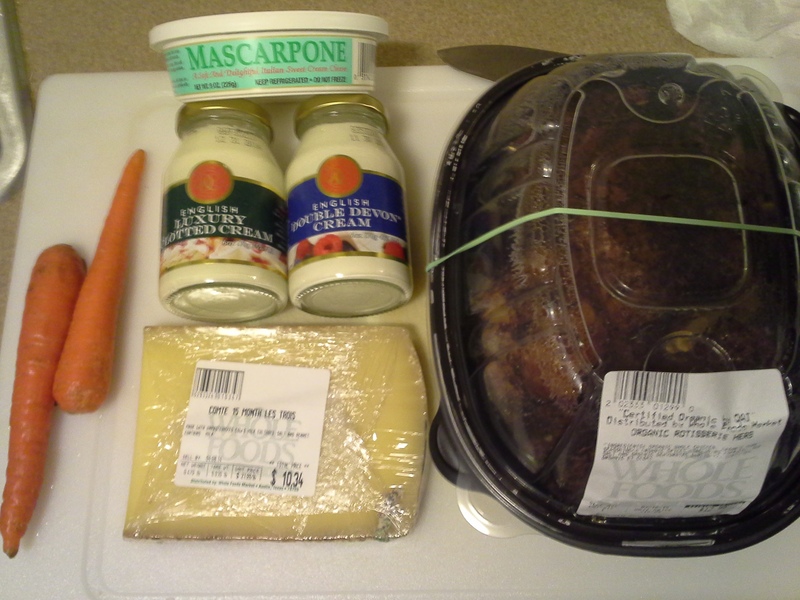 I ate a bunch of the chicken, both of the carrots, a good chunk of the Comté, and about two tablespoons each of the mascarpone, clotted cream, and double Devon cream. I’ve felt a little logy for the rest of the evening, and that could well be the sudden reintroduction of a few different kinds of dairy — but, frankly, it could be simply because I ate too much chicken. Further testing required.